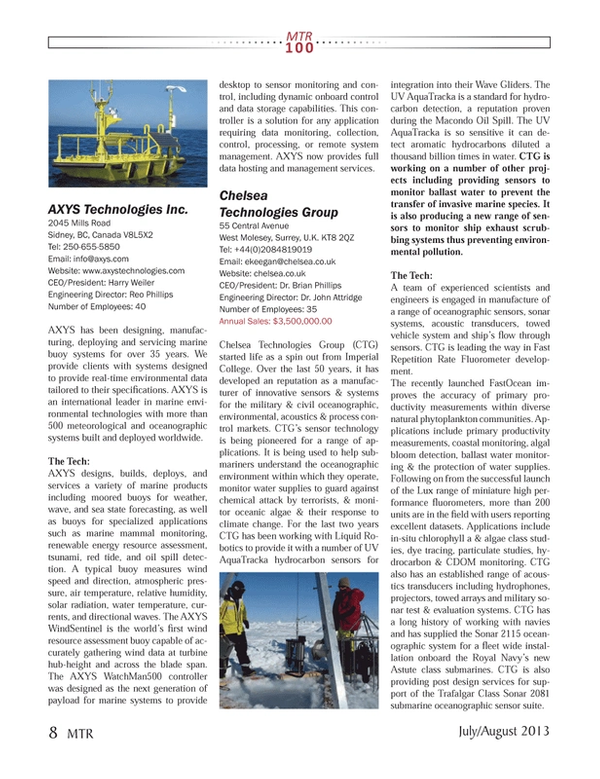 MTR100 13' AXYS Technologies Inc.
AXYS has been designing, manufacturing, deploying and servicing marine buoy systems for over 35 years. We provide clients with systems designed to provide real-time environmental data tailored to their specifications. AXYS is an international leader in marine environmental technologies with more than 500 meteorological and oceanographic systems built and deployed worldwide. AXYS designs, builds, deploys and services a variety of marine products including moored buoys for weather, wave, and sea state forecasting, as well as buoys for specialized applications such as marine mammal monitoring, renewable energy resource assessment, tsunami, red tide, and oil spill detection. A typical buoy measures wind speed and direction, atmospheric pressure, air temperature, relative humidity, solar radiation, water temperature, currents, and directional waves. The AXYS WindSentinel is the world’s first wind resource assessment buoy capable of accurately gathering wind data at turbine hub-height and across the blade span. The AXYS WatchMan500 controller was designed as the next generation of payload for marine systems to provide desktop to sensor monitoring and control, including dynamic onboard control and data storage capabilities. This controller is a solution for any application requiring data monitoring, collection, control, processing, or remote system management. AXYS now provides full data hosting and management services.